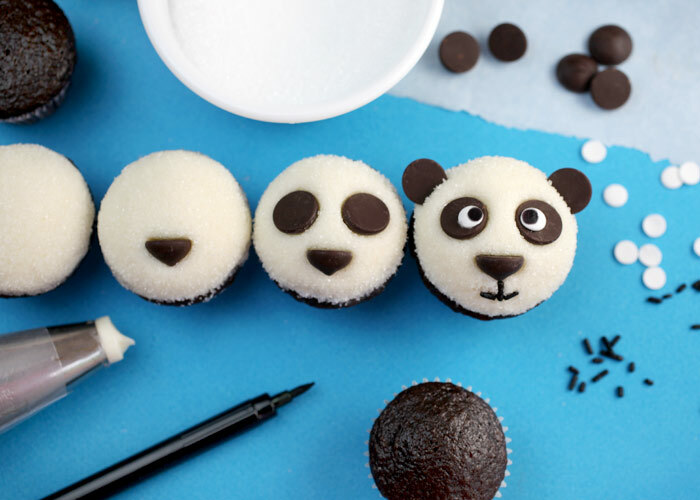 Here is a fun way to decorate cupcakes to look like panda bears, courtesy of Bakerella. 1. cupcake mix – for as many cupcakes as you want or need. chocolate flavor creates a complete look, but you can do any flavor. 2. chocolate chips – to make the ears, nose, and eye base. Ghiradelli brand has better diameter for this purpose, or another of comparable size. 3. white frosting – enough for all your cupcakes. 4. white sanding sugar – to give the texture of fur. 5. Jimmies – chocolate or black to make mouth lines. 6. white pastel confetti sprinkles – for the white of the eye. 7. black edible ink pen – to draw pupils on the white sprinkles. 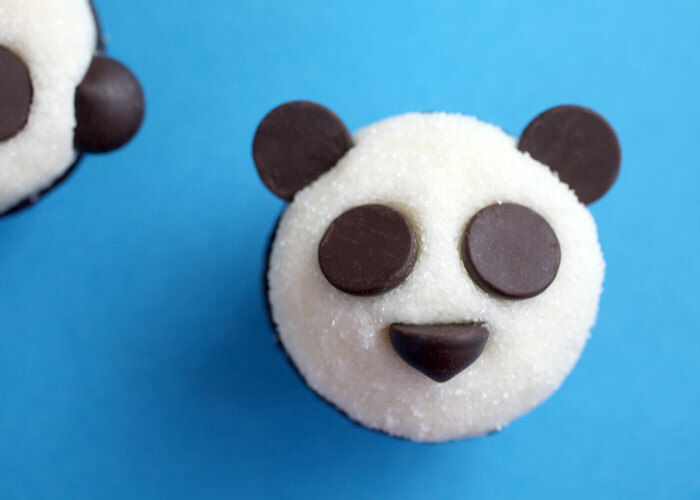 Note: If you wanted to make larger panda cupcakes just tweak the ingredients to use chocolate drops or large chocolate chips (which you might have to cut in half for the nose), larger or more sprinkles for the mouths, and use premade candy eyes or get creative with a circle of icing or fondant with a black sphere sprinkle or black edible ink circle for pupils. The process of putting them together would be the same. 1. 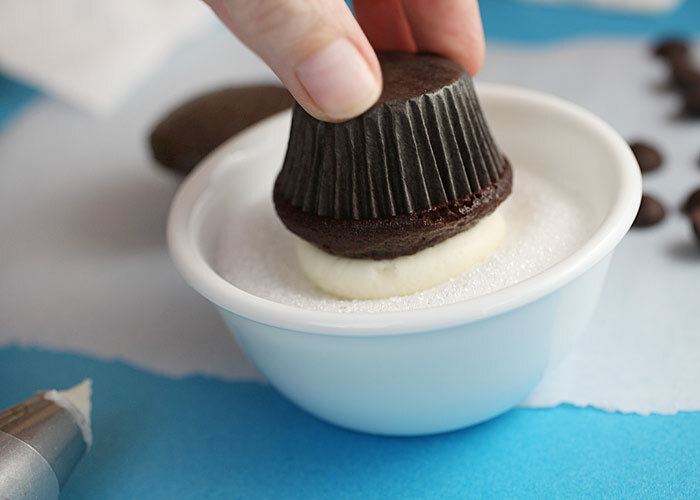 Make your cupcakes according to your favorite recipe or the box in a mini cupcake pan (hey sometimes we all need to save a little time). Allow to cool. 2. Frost the cupcakes with the white frosting. 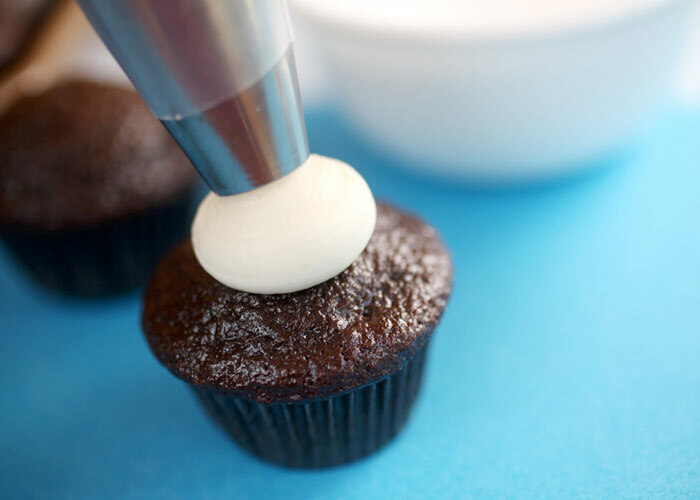 A decorator bag with Ateco tip #807 will help to pipe a small mound of frosting on top of the cupcake. You do not need to cover the whole top because you will be pressing them in to the sanding sugar which will force the mound out to cover the whole top. 3. 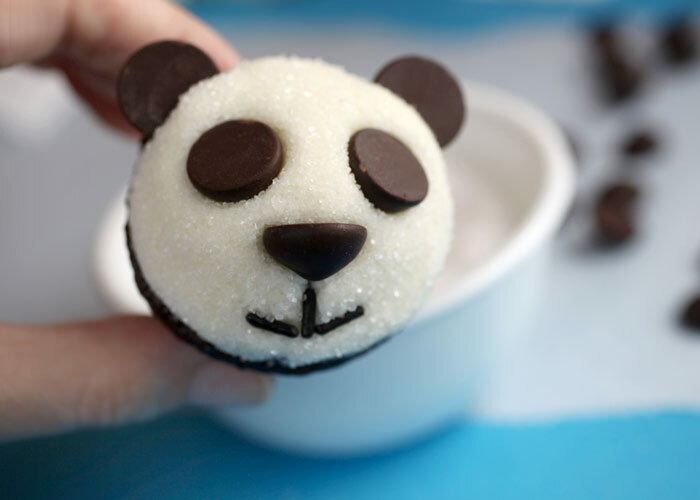 Press the frosted cupcakes into the sanding sugar to spread the frosting and create a fur like texture. 4. Press chocolate chips into the frosting to create the face. One should go sideways, point facing downward, towards the bottom of the face to create the nose. Two should go point down into the frosting above that to make the base for the eyes. And two should go into the sides of the frosting, point down, to create ears. 5. Press the Jimmies into the frosting to create any type of mouth you want. 6. Finish the eyes by drawing circles on the confetti sprinkles and then attach them to the chocolate chip base with a bit of frosting. 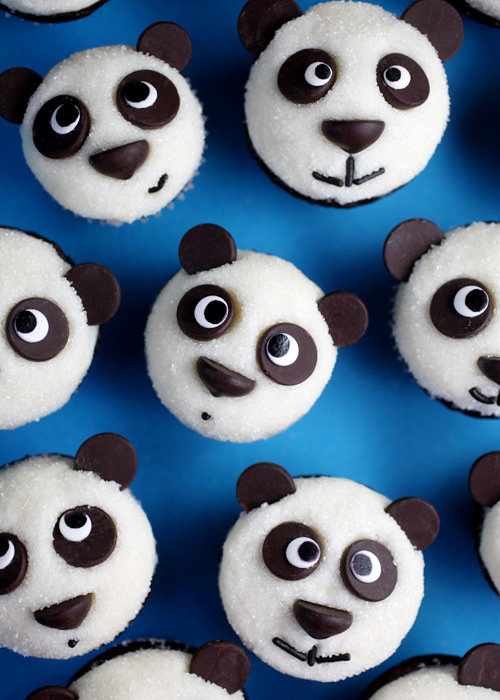 Or use frosting to make the eyes, or attach premade candy eyes. 7. Make sure each face is how you would like them. Having the sanding sugar over the frosting also allows you to reshape the frosting to get your desired look. This design is really cute and allows you to do your own take on just how a panda should look. Great for kids parties or just because! You can see more pictures and get Bakerella’s cupcake and frosting recipes here. The Panda Cub is a Girl!